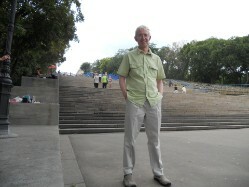 Well, this is me stood at the bottom of the famous steps in Odessa, a long way from Worcester, which is where I was born on 17th March 1957. I was brought up and educated in the Vale of Evesham, then went to teacher training college in Birmingham, graduating with a B.Ed in 1978. I taught in schools in Brighton, Southend and Uxbridge before my first career change, which took me through Abbey Life Assurance, Unisys and Diligenta, a career in IT and ultimately a role as an IT Project Manager. Whilst in 'The Office' I qualified as an ACII (Associate of the Chartered Insurance Institute) and am a Chartered Insurer. I am fortunate enough to live today in the Dorset town of Christchurch, which is venerable and picturesque. I have been married to Val for almost 30 years and have 3 step-children and 5 step-grandchildren, who I just regard as grandchildren. My passions are writing, history, football and the people I love, not necessarily in that order. My one remaining ambition to fulfil was to get a book published, which was achieved in August 2015.